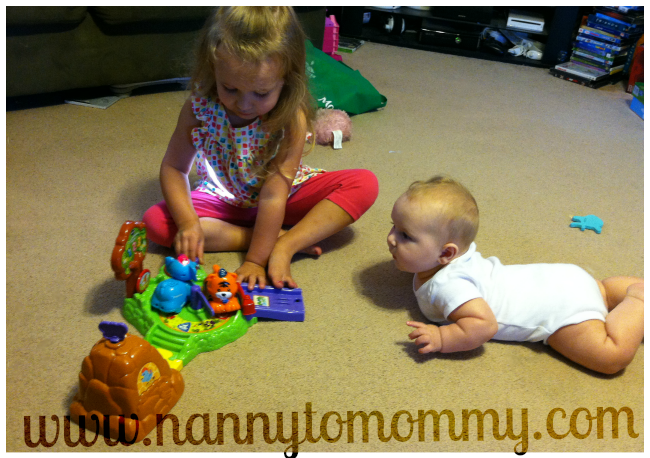 I received the products featured below complimentary from Vtech. All opinions are my own. 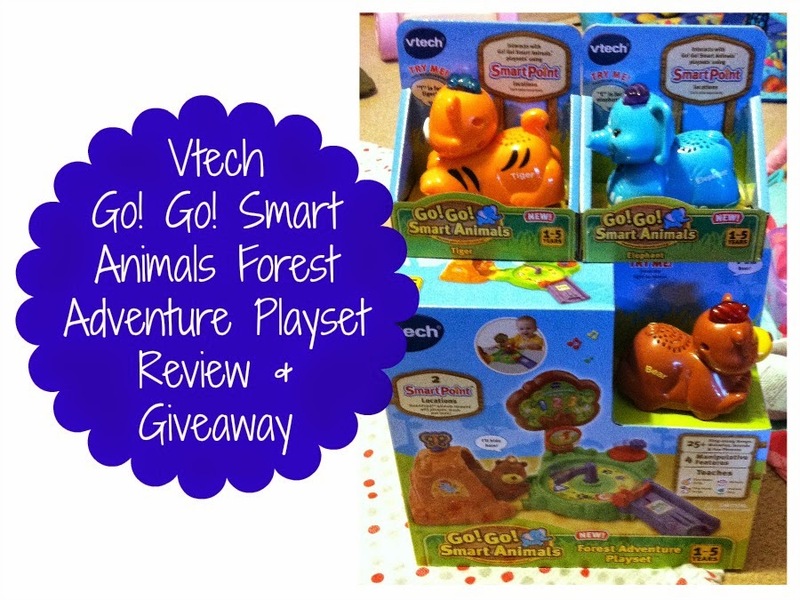 Another featured product in our 2014 Holiday Gift Guide comes to us from Vtech. I received the Go! Go! 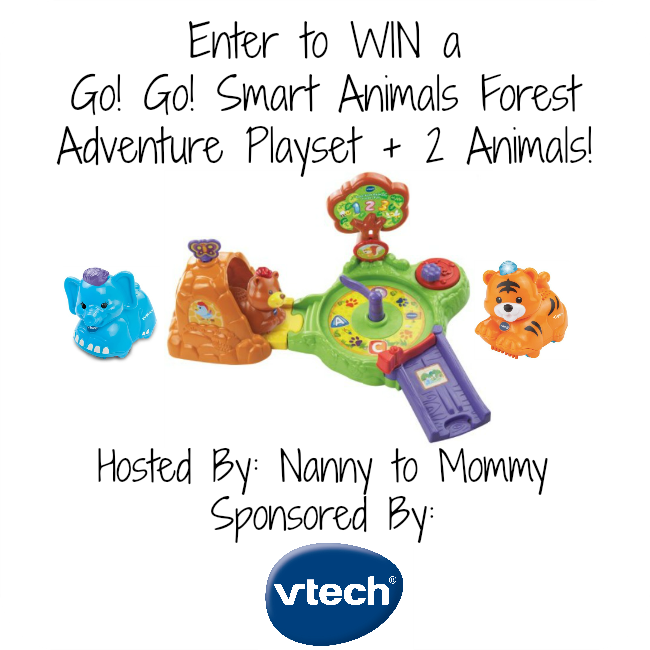 Smart Animals™ Forest Adventure Playset™ and two Go! Go! Smart Animals™ for review. This play set was designed with 1 to 5 year olds in mind, so my almost 4 year old was the perfect little one to review this product! My daughter was so excited when she saw the box. I had intentions of saving this until Christmas (and previewing it myself), but she had other plans...I could hardly snap a quick pic before she was trying to rip the box apart! And set up was so easy, no need for a pic. My daughter has been playing with this non-stop. She loves all of the songs and has even memorized some of them. She loves "racing" the animals across the living room too. We also received Eleanor the Elephant and Tyrone the Tiger to review as well. Each animal works with SmartPoint locations on Go! Go! Smart Animals and Go! Go! Smart Wheels playsets. 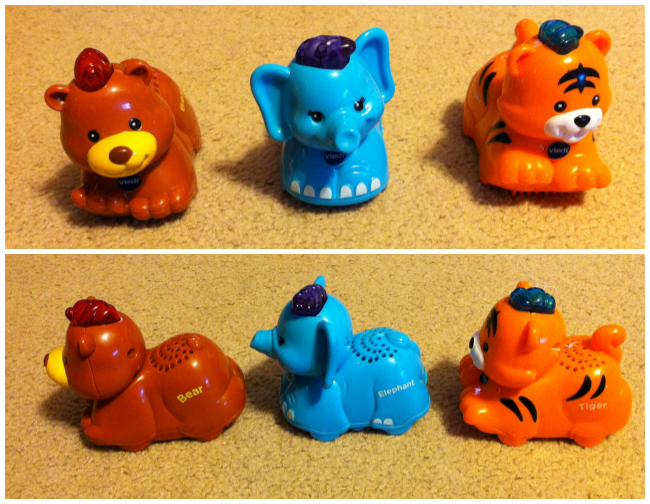 They sing songs as well as teach your little one their corresponding letter (T for Tiger, E for Elephant). They have automatic shut off (which is a great feature to conserve battery), but they are temperamental and tend to go off very easily. BUT they do have an on/off switch as well. My 6 month old has also taken an interest to this playset, but I think he has a little ways to go before it will be the right fit for him. So much fun has been had with this play set in this house. And I can't wait until Christmas because there are other playsets and animas that can be connected/played with this set. One VERY lucky Nanny to Mommy reader will have the opportunity to win a Go!Go! Smart Animals Forest Adventure Playset + 2 Animals! RV $30! Open to US only, must be 18+ to enter. Giveaway open to US only, must be 18+ to enter. Giveaway ends 10/1 at midnight EST. Winner is chosen via Random.org, all winning entries are verified. No social media was involved in this giveaway in any way. Although I received free products, I received no monetary compensation and all opinions are my own. Sponsor is responsible for prize fulfillment. I like the cute elephant! This would be for my little grandchildren to play with together! No contest there, the cutest animal is the crocodile and my daughter would love this. I like the tiger. I'd have this around for my niece to play with when she stops by! The Elephant Is My Favorite Animal, I'd Give This To My Nephew. The hippo is my favorite! This would be for my kids to share - i think they'd love it! I love the little tiger. my daughter would love this toy so it would be going to her. The hippo! I would give it to my niece. The elephant is my favorite. I would give this to my son, and I think he would love it. I like the tiger and I would give this to my grandson. I love the elephant! My 3 year old would love playing with this and we have a baby due in March who would love it as well. I like the Tiger and would give this to my littlest grand. The tiger is adorable! I would give this to my 3-year old and she'll play with her brother when he's born. I love giraffes! And I would love to win this awesome toy for my little man! I like the giraffe and this would be for my daughter. I would give this to my daughter. I love the lion. The tiger is my favorite! This would be for my two boys, I'm sure their love play with it together! The tiger is cute! My 4 year old son would love this. I LOVE tigers since I was 9 so that is my favorite. Would want this for my son. I love the hippo and my niece would absolutely love this! My favorite is the giraffe and I would give it to my daughter who loves giraffes currently. My favorite is the elephant! I would give this to my grandson! He would love it! This would definitely be a gift to a lovely friend who is expecting a boy! We love the bright blue elephant! I like the elephant. I would give this to my grandson -- I'm sure he would really enjoy it. I love the Tiger and this would be for my granddaughter! I love the elephant! I would give this to my niece! The bear is cute! I would give it to a new little family member :) . I'd give this to my friend's daughter on her birthday. I would say elephant out of the three pictured and out of the other animals monkey. I would give it to my son he just turned 2. I would give it to my daughter for Christmas she just turned 2. I think she would love the monkey and hippo. I just love the Elephant!!! I would give this to my 1 and 3 yr old daughters! They would love it! The tiger is adorable!! I would love to win this for my daughter! I like the tiger, I'd give it to my great niece, she'd have a blast with this. The tiger for my nephew because he is my little tiger. I like the tiger. This would be for my son and daughter! The tiger is my favorite and my son would get this! the elephant is my favorite and i would give it to my daughter. We love tigers here and my son would go crazy for it! I love the tiger the most, and I would give this to my youngest for her 1st birthday which is coming up Nov 5th! I love the tiger. This would be for my little boy. I love penguins! Would love to win for my son. I love the elephant! My 3.5 year old and almost 1 year old would both love this! The Blue Elephant :) I would give it to my son! The elephant. My daughter would love this. It looks like so much fun!! The elephant. My daughter would love this so much! these are adorable! I love the little tiger, and I think my nephew would, too!